The Saga Re-Read #16: Journalism! By Zack Quaintance — I’m a journalist by trade...technically. I don’t have shadowy conversations with anonymous sources like you see in the movie, and I’ve certainly not been put at wartime risk (although I did cover the Mexican drug war from Texas just a tiny bit in the late ‘00s). Anyway, this is all a means of pointing out that by being a staff writer for a fairly dry trade publication, I have much room in my heart set aside for romanticizing the work done by some of the world’s most daring reporters, including those appearing in stories. Saga #16 is an issue brimming with romanticize journalism, conveyed right from its cover by this story’s journalistic pair, Upsher and Doff. Perhaps unsurprisingly, I ended up liking it quite a bit. In addition to my proclivity to appreciate journalists in fiction, I’ve just been appreciating the larger function these two are having with Saga, serving as a neutral pair and the first significant set of independent characters to not immediately want our little family to be caught, thereby facing instant annihilation (Heist aside). So there’s my preamble. Now, let’s get to the issue, the art, and the story! Technically, our friends Upsher and Doff don’t really learn much more about the biggest story in the universe than they already knew when this issue started. We do, however, learn that their sexuality makes them endangered on their home planet, should it ever come to light...which as re-readers may remember is a chip played against them later in the plot. The Cover: Our (relatively) new friends Upsher and Doff make their first cover appearance. It’s also a rare appearance for them, because unlike more visually-intriguing side characters like Prince Robot IV, cover status is a pretty rare thing for these two. There’s a certain irony in that, if you ask me, seeing as they surely are the characters in our story most driven by appearing on page one. Anyway, this cover is a fine one, showing them doing their jobs in a firefight as their obvious status as journalists does little to nothing to protect them, something that will factor into not only this issue but their continued safeties as we move forward. The First Page: An intriguing and well-done image, to be sure, if not one of the more outlandish first pages in Saga. To be fair, though, that bar has been set pretty high for this book by first pages of the past. This one simply lets us know we’re in wings territory (as is made obvious by what looks like workaday commuters filling the sky). We also know from this familiar sneering face and the no comment that the character in this panel is talking to our cover duo, Upsher and Doff. So it does it’s job that way by jump-starting this issue’s story. 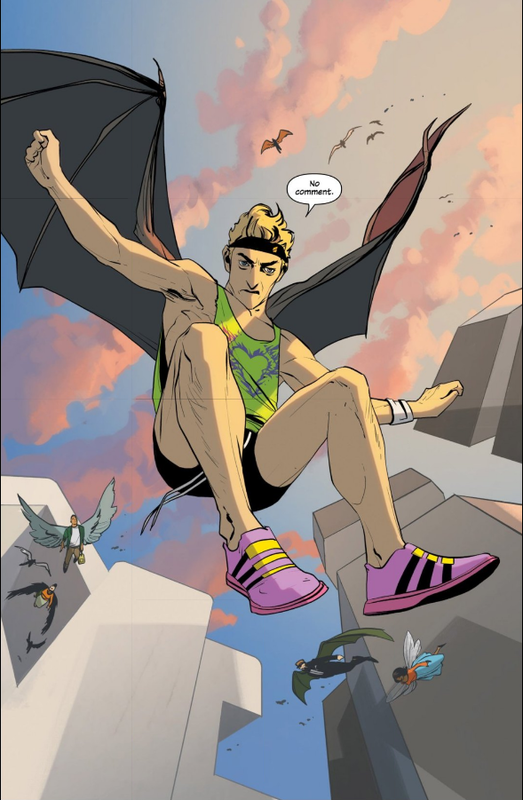 The Surface: This yet another issue of Saga packed with plot, moving forward four separate storylines, three of them to the point of intersection where this arc first started. It’s all well-done too, never feeling like Vaughan and Staples are just moving their people into positions where they need them in order to keep facilitating all that plot. This is, essentially, an organic story that feels real, and that’s largely due in my opinion to the quality of the dialogue, the character motivations giving rise to that dialogue, and the distinct voices each of them have. The family banter within Heist’s home was especially a treat, including basically all of the exchanges that involved Marko’s mom. The Subtext: As I mentioned in my intro, this reread is really helping me see the value of Upsher and Doff within the larger narrative. They are, essentially, a neutral party, an embodiment of the fourth estate. What’s more, is that Vaughan portrays them in a way that doesn’t play into tired ideas about the media being vultures or seedy or detrimental the world. They’re simply conduits for information, working stiffs who believe heartily in the value of knowledge and truth for society. They’re without question self interested, motivated by their own glory, which for my money is where most journalists go wrong, driven as they are in almost equal parts by societal validation and societal impact. Foreshadowing: This is a weird issue to discuss foreshadowing in, largely because it ends at a place that a previous issue has already shown us, albeit with a little more context than we had before. It does, however, promise that what’s to follow what we already know is going to be action-packed. So that’s certainly not nothing.